We’ve moved to a new state and we have been getting settled into our new home. Things have been crazy but good. I’ve enjoyed a summer full of swimming and golf lessons, but I’ve been ready to get back into our school routine. Actually, I’ve been most excited about using our new homeschool room. This is the room that I’ve been wanting for years. It’s big and bright and open and perfect. It has a huge closet that’s just right for storing extra books and curriculum. There is room for my bookshelves and our large table. And even though it’s in the basement it has two big windows for lots of light. Our homeschool room is one of the rooms in our basement. We also have a nearby family room with large chairs for reading or TV watching, a playroom full of the kids’ toys, and a small kitchen for snacks and all of our art and science projects. I could not have asked for a better homeschool space! For the past two months I’ve been unpacking and putting together our new school room with lots of help from my hubby. I’m so excited about how it turned out! So, enjoy the photo tour and be sure and watch the video tour at the bottom of this post. You can see our large homeschool table on the left with our computer desk in the far corner. Straight in front is our tot school sensory table. Here’s a shot from the door. I love my new chair! Here is my comfy reading chair and our two bookshelves – one for notebooks and one for our books. You can also see my new door that the kids painted for me (with lots of help from my hubby). This is our computer desk with some floating shelves above. The shelf holds flash cards and some art supplies. This is our homeschool table with the 4 drawers. I put the curriculum for each child in their own set of drawers by their chair. This is the opposite wall with our whiteboard and our magnetic wall organizer. You can also see our giant closet in the corner. Love these magnetic organizers from the Container Store. They hold all of our extra paper, pencils, pends, scissors, rulers, and post it notes. I’m so excited about my new barn-style door. Love the teal! Our table near the windows. Love the natural light! And here’s a quick video tour of the new room! Thanks for visiting our new school room! 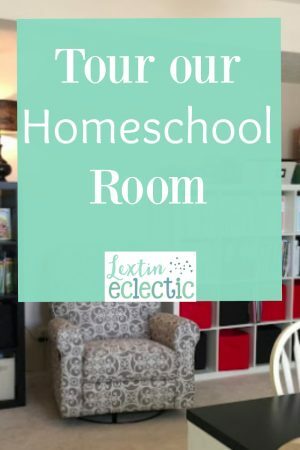 Please don’t believe that you have to have a Pinterest-worthy homeschool room to be a successful homeschooler. While I love my homeschool room it’s not Pinterest-worthy and it doesn’t define our homeschool. If you need a little levity and an honest look at the lies homeschool moms believe, check out this book by Todd Wilson. He’s a homeschool dad with a great perspective on homeschool moms. Let him debunk all those homeschool myths! What a great looking room! I love the door and your chair. Thank you! Those are two of my favorite things in the room! 🙂 The door is so much fun and is much better than the old door that took up way too much room when open. Lexi, I really liked your last school room and am happy you have been able to create another great environment for your children and you in your new home. I think the chair and door, especially the color of the door, are going to be winners this time around. Lexi, I think we are moving in to your house! Beautiful classroom to invite an awesome time of fellowship and learning! Blessing to your sweet family! Have a wonderful year! Thank you! And maybe you should come visit Tomara 🙂 Wouldn't the kids have fun playing together! What a great room! I love the table.